Every day more and more religious speech falls afoul of Indonesia’s Blasphemy Law, but so far press freedoms have escaped overt restrictions, according to Endy Bayuni, the former editor of the Jakarta Post, Indonesia's largest English-language daily. “We have had one or two journalists get in trouble with the Blasphemy Law, but you really have to be a stupid or ignorant journalist to find yourself in trouble,” Bayuni told a an international gathering of journalists, sponsored by The Media Project, in Jakarta to study global press-freedom issues. Bayuni recounted the case of an unfortunate editorial writer at the local daily Prioritas. The columnist’s bumbling piece attempted to compliment then president Soeharto by comparing him to the highly regarded ancient Egyptian pharaoh Farouk. President Soeharto, being more familiar with the Koran than ancient Egypt, was outraged because the Farouk of the Koran is a very evil man. Prioritas eventually closed its operations after a series of similar run-ins with Soeharto. Indonesia does have profound shortcomings, however, in its level of freedom for minority religions to publicly express their faiths, Bayuni said. The result has been jail time for those convicted on charges of blasphemy, as well as the outright banning of offending religious groups. As recently as April of 2010, a coalition of minority religious groups initiated a legal challenge to the Blasphemy Law, which has been in effect since 1965, arguing that the law illegally discriminates against minorities. The Supreme Court rejected the petition. That clear victory emboldened conservative Islamists who are pressing their advantage by bringing new cases against unwanted religions. “For now, we have to live with this,” said Bayuni, as he detailed the stigmatization process. First, activist Islamists seek to define a sect’s beliefs or practices as “deviant”. Bayuni explained that “deviance” will not stand up in court since Indonesian law does not allow the state to decide the substance of religious teaching, but the informal denunciation will get the legal process rolling. The next step is to secure a fatwa, usually issued by the Indonesian Ulema Council, officially declaring the sect “blasphemous”. Self-appointed vigilantes, such as the infamous Front for Islamic Defenders, then systematically harass the “blasphemous” group. The negative attention draws the real police, who arrest the blaspheming leaders and charge them with “disturbing peace and order”. Most recently, the Indonesian government has sanctioned the Ahmadiyyah sect, a small Islamic group with origins in India that has been active in Indonesia for 90 years. Ahmadiyyahs are controversial because they believe that Muhammed is not the last prophet. 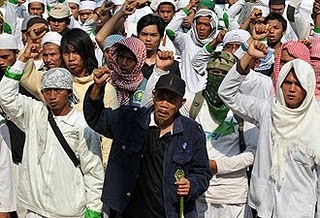 Acting on the Ulema Council’s denunciation alone, the government has prohibited the sect from calling itself a religion and from seeking converts, Bayuni reported. It is even more common for individuals than groups to be targets of the Blasphemy Law. In one of the dozens of recent cases, a man was jailed for two years for merely saying a prayer in the Indonesian language instead of Arabic, Bayuni noted. The real question for media in this environment is how to treat these stories, he said. The religious issues, of course, are extremely sensitive, and reporting on the conflicts is almost certain to provoke strong, emotional reactions from the public. Reporters most often give in to the social pressures by simply applying the label "deviant" to any group that conservatives have put in their sights. As editor at the Jakarta Post, Bayuni took a strong editorial stand against anything that undermined freedom of association and religion. Though Bayuni insisted on a clear line between reporting and editorializing, he said his paper always highlighted the plight of suffering minorities. The Post went so far as to allow minority leaders to respond in the paper to any charges of blasphemy. Bayuni does not despair over these controversies and setbacks. He thinks such things are simply part of the growing pains of a young democracy. “Indonesia is an emerging democracy, and we anticipated these issues would surface at some point.” Bayuni concluded. “At least we have an open debate on these issues, and minority religions can petition for the repeal of the Blasphemy Law, which is more than minorities enjoy in other developing countries. Photo of demonstrators protesting the review of the Blasphemy Law.